Up-Cycled Art As usual, Conservation was on hand to document the condition of the newest addition to the courtyard. As an added bonus, we got to chat with the artist, A. Balasubramaniam, a.k.a. Bala. While taking photos, I saw that the sculpture is made up of small rods of metal welded together. I noticed shallow threads on a few of the pieces of metal and asked Bala if he had welded nails together. In fact, he told me, the sculpture is made of bicycle spokes. Nice! The spokes are cut up and welded together into the repeating triangle pattern that makes up the structure of the artwork. Bala said he chose bicycle spokes because they are light-weight and have some flexibility. It’s true; if you look at the base of the sculpture, you can see that the convex shape inverts and pushes inward where it rests on the flat slate pavers of the courtyard. Minor Repairs The sculpture came to the Phillips from India after a long journey by truck and by sea. As we noted its condition, we found that one branch on the inside of the sculpture had snapped almost in two. A few weak spots at the base of the branch had given into metal fatigue somewhere along the way and did not survive the trip. Bala took it all in stride, and he and the Phillips’s Installations Manager, Bill Koburg, went on a fishing expedition with some copper wire and a picture hook. They snagged the branch with the picture hook and carefully pulled it up, aligning the break as well as possible. Bala and Bill then secured the broken branch in its proper position using monofilament, or fishing line (rated for 15 lbs). I fetched some acrylic paint from the studio, which Bala used to tone the fishing line so it would be less noticeable. 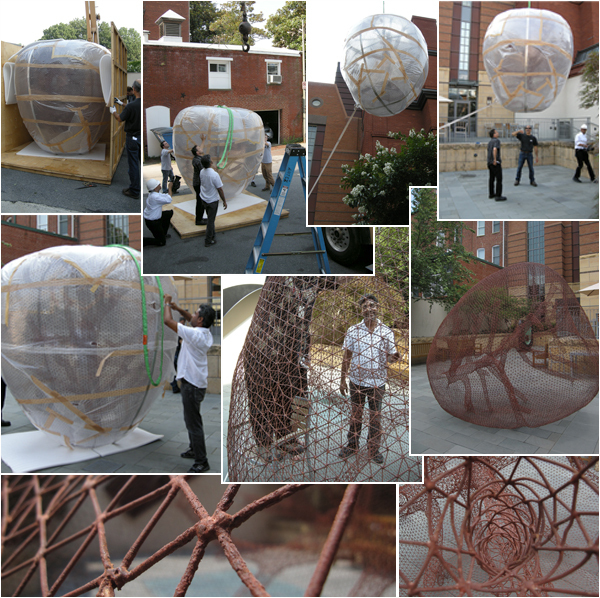 The second part of Bala’s sculptural installation arrived in the Hunter Courtyard this morning after a long journey. The artist oversaw the delivery and installation. We’re all thrilled to finally see this work in person! A. Balasubramaniam just sent us this enticing travel footage of his 8 x 10 x 10 feet, 200 pound steel sculpture currently en route to the Phillips. It lands in the courtyard on or around June 10 as part of the Intersections series.